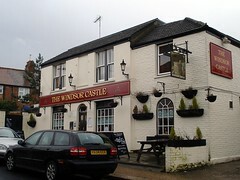 Small single-room locals' pub in East Finchley. It's part of the McMullen estate, but is independently managed. Kake visited on a Tuesday afternoon in March 2009. I was the only customer apart from an older gentleman who came in for a single swiftly-drunk pint during my visit. Three of the six handpumps were on, offering McMullen AK (£1.45/half), McMullen County, and Sweet Chariot English Bitter. The decor is very traditional; everything's upholstered, even the small corner shelf which holds a standard lamp. There's a small telly mounted by the door, facing the bar; this was showing cricket with the sound off during my visit. There's also a larger flatscreen, technically in a side room but visible from most of the pub. The side room also has a fruit machine, though not a noisy one. Background music during my visit was provided by a Coldplay album; this may not be the normal state of affairs. There were a few board games on the side of the bar — draughts, Connect 4, that sort of thing. A board seen outside in March 2009 advertised "12 till 9:30 / English and Thai / full menu served Mon, Wed, Thur, Fri, Sat / after 4 Sun". This may mean that there's no food at all on Tuesdays. Various signs seen in March 2009 advertised quiz nights on Mondays, Wednesday, and Sundays, starting at 9pm. Accessibility: No step to get in, and the ladies' doubles as an accessible loo. Last visited by Kake, 10 March 2009. Opening times taken from a board seen outside on that visit. Last edited 2013-05-10 08:17:39 (version 5; diff). List all versions. Page last edited 2013-05-10 08:17:39 (version 5).